Unless you've been living under a rock, you've likely heard the buzz swarming the topic of probiotics in recent years. But one such topic that's just as important (or perhaps even more so), is prebiotics—the stealthy form of fiber that fuels the healthy-inducing fire courtesy of probiotics. "Prebiotics are the nondigestible carbohydrates, or fibers, that serve as the 'food' for our gut-healthy bacteria—probiotics," explains Lauren O'Connor, registered dietitian at Nutri Savvy Health. "These healthy fibers include inulin, fructooligosaccharides, galactooligosaccharides, beta glucans, pectins, and resistant starches." So how do we get them? Well, we eat them of course! Keep clicking for 12 of the best prebiotic foods, according to nutritionists. "Prebiotics are a type of dietary fiber that promote healthy gut bacteria. Essentially, they serve as precursors to probiotics, and help feed and grow gut bacteria," explains Sammi Haber, MS, RD, CDN of Nutrition Works NY. 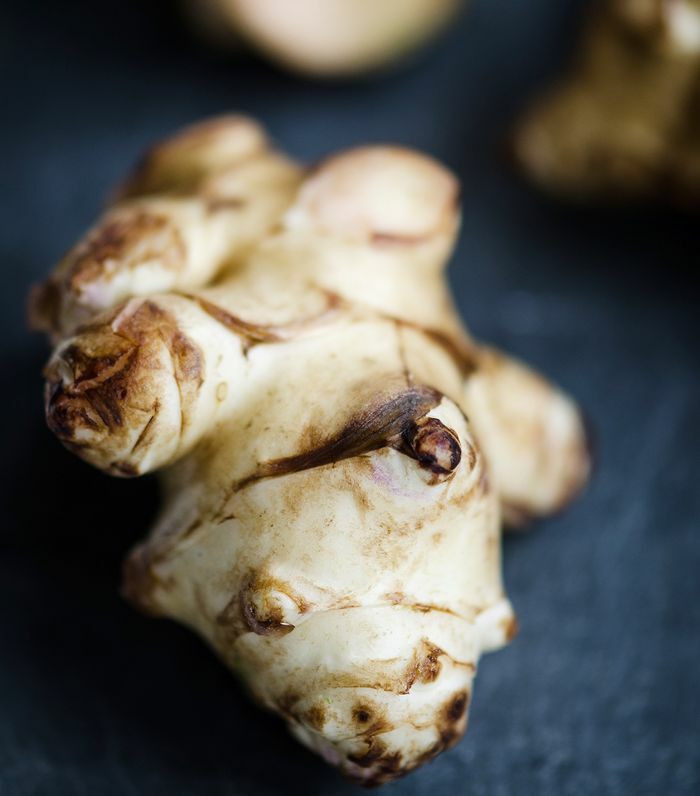 "Jerusalem artichokes are a wonderful natural source." As we learned from O'Connor, mushrooms (shiitake, specifically) contain essential prebiotics known as beta-glucans, which act as naturally occurring polysaccharides. Their benefit: They can aid in healing and immunity. So do as O'Connor suggests and throw them into your next stir-fry. Lavva is a plant-based, dairy-free yogurt that not only contains the gut-healthy probiotics common in yogurt, but prebiotics as well. This unique blend contains plantain (a source of resistant starch) and the not so common Pili nut, a rich, buttery nut that's a great source of Vitamin E and Magnesium. "Made with plantain in the blend, Lavva contains prebiotics as well as live vegan probiotic cultures. There's no sugar added, and the plain flavor is a perfect base for berries or other healthy toppings," says O' Connor. If you're looking to boost your diet with prebiotics in addition to some extra greenery, O'Connor suggests opting for asparagus. "It will retain most of its prebiotic content if cooked al dente. However, you can enjoy it fresh, crisp, and raw served with an herbed Greek yogurt dip," she says. This way, you're getting a one-two punch of healthy gut-improving benefits, thanks to essential prebiotics and probiotics. "Potatoes are a great source of resistant starch for optimum prebiotic benefit," O'Connor confirms. The hitch: You have to cook potatoes to eat them, so they'll inevitably lose some of that healthy resistant starch. However, according to O'Connor, those fibers will regain some of their strength once they've cooled. She recommends serving up potato salad as a prebiotic-rich side option. Attention all garlic-lovers: good news. A wonderful natural source of prebiotics, O'Connor explains to us that the power-packed food contains approximately 17% prebiotic fiber per ounce. However, there is one caveat: "Once it is cooked, most of the fiber is converted into sugars." To get it in the raw, try out O'Connor's Greek Yogurt-Based Creamy Turmeric Dressing, which she tells us includes a whole clove of raw garlic. According to O'Connor, if you cook onions just enough so that they're easy to chew (and thus easier to digest) but not until they're overly soft, you'll be able to maintain most of their natural prebiotic benefits. "Like garlic, the more you cook, the more its prebiotic content is lost to sugars as the starch breaks down." "Honey contains oligosaccharides, a prebiotic substance often added to processed foods for its sweetness," explains O'Connor. "However, because honey is a sugar, it is best to keep moderation in mind. Try my five-ingredient granola (it's got the benefit of two prebiotic foods—honey and raw oats) for a prebiotic-filled breakfast." According to O'Connor, whole oats are a significant source of beta-glucan fiber in addition to some resistant starch. "Oats are a great choice because they're a satisfying way to include whole grains in your diet and they're also incredibly versatile. One of my favorite ways to combine two prebiotic foods is to include chopped apple in my oatmeal stewed with walnuts for a crunch and a bit of tapioca starch for creaminess." To maximize her recipe further, O'Connor recommends adding a dollop of plain yogurt for a supercharge of probiotics. "You can find raw chicory root most commonly in coffee substitutes such as Teechino," shares O'Connor. But be warned—chicory root is an incredibly saturated source of prebiotics, so you won't need a lot to reap the benefits. "Too much inulin can cause stomach distress, thus much of it is roasted to reduce the amount of inulin fiber," she says. "Unpasteurized apple cider vinegar contains pectin, making it a great choice for prebiotic benefits," says O'Connor.